The sudden cancellation of a highly anticipated Caribana-related event in Vaughan has left some festivalgoers fuming. The sudden cancellation of one of weekend's most highly-anticipated Caribana events in Vaughan has left some festivalgoers fuming. Carnival Kingdom, which was organized by SOS Fest Inc. and was supposed to feature artists like Bunji Garlin, Fay Ann Lyons and Destra, was reportedly cancelled just moments before doors were to open at 9 p.m.
Ricardo Rowe, legal representative for SOS, says organizers received a text message from Vaughan around 7:15 p.m. Saturday, stating their permit had been revoked with officials coming to clear the area. "We were shocked, a lot of people were in disbelief," said Rowe, adding they were reaching out to ticketholders Sunday to give them refund information. Tickets cost between $35 and $95. Usually if a permit is violated, they would have the chance to pay a fine, said Rowe. "I'm not sure why it was so heavy-handed ... it's millions of dollars," said Rowe. "Everyone had been paid ... a lot of money went right out the door." A statement by Carnival Kingdom said the event had "all of its permits in place," ahead of time. "The permits were pulled by the city just 2 hours before doors opening. For reasons we don't know at this time fully. Every event executed has been complete with smooth process and professionalism," the statement said. In a statement to CBC Toronto, a spokesperson for the city of Vaughan said the permit was revoked after "it was determined that the organizers did not comply with the terms." It added Sunday afternoon that the decisions to grant and revoke the permit were made by city staff and not the mayor or council. "The City of Vaughan also received a number of public complaints about the event," it said. When contacted by CBC Toronto for more information, the city said it had "no further comment at this time." The cancellation of Carnival Kingdom had sparked fierce backlash on social media with many struggling to understand the city's decision. Some said they would go as far as filing a freedom of information request to learn why the permit was revoked. ​Justin Mohammad said he was in line to attend the event just before 9 p.m. with his family. A half-hour later, security came to tell them it was cancelled. "People were getting anxious, they wanted to go in and start having a good time and enjoy the music and enjoy the weekend," he said, adding that security told them they didn't know why it was shut down. Brandon Bacchus, 24, said he and a friend were driving into the parking lot when a police officer told them the event was cancelled. "We were pretty upset," said Bacchus. "It was handled terribly. I'm confused as to whether it was noise complaints, but an event as big as this, it shouldn't have been shut down on such short notice." Sundas Malik was hoping to attend the event Saturday and said she was "heartbroken" to learn that it was cancelled. "People worked hard to make this party happen. They worked really hard and they love this party," Malik said. "People come down here to have fun and just show love and then last minute they cancel the party." For some, like Malik, the city's response wasn't enough. "What happened last night should never have happened. It was very unprofessional of the city of Vaughan to do that," Malik said. "It wasn't okay to do that to people last minute." Some responded to the city's decision on Twitter and said a similar event on Friday brought significant noise. Rowe said he was told there had been noise complaints from about six kilometres away following a concert at the same venue on Friday night. "The people that were close by, and the surrounding areas, they didn't hear any music," said Rowe, adding that the venue is in an industrial area and their team measures decibel levels to ensure they meet standards. 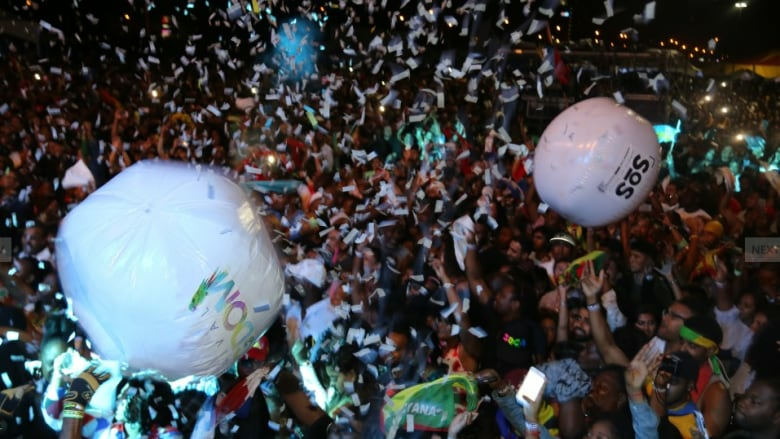 Trinidadian singer Machel Montano, who was scheduled to perform at the event, said in an Instagram post to his fans that he learned the event had been cancelled as he was getting dressed to go to the venue. "I'm truly saddened that I was not able to perform for the fans — I never miss a show and this one was not in my, or my team's, control," he said. "I love performing here and we were going to have a time together last night." The sold out event was to be held in the parking lot of Improve Canada, a home improvement mall at Keele Street and Steeles Avenue W., south of Highway 407. The venue also hosted Rejourvert 2018, another SOS Fest event, the night before. A Facebook page for Carnival Kingdom said that over 10,000 people from all over the world were expected to attend the event Saturday night. For her part, Malik says she feels badly for what the event's shutdown meant for those who travelled to Toronto for the event. "If I flew down here on vacation to go to a party like this and this happened, I would be really upset and I would not want to come back to Toronto." An Instagram page by event organizers says refunds would be issued in 72 hours.